I completely forgot about card making day yesterday! What a shocker! Actually we were busy all day anyway so I wouldn't have had time to make anything. I spent my Sunday blog hopping and couldn't believe all the challenges for card making day and decided to partcipate in a few. I check on Suzy's blog often Inky Rubber. 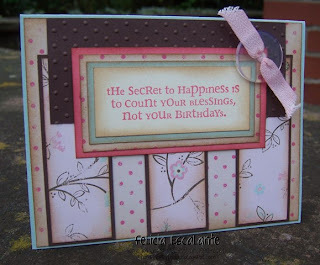 I LOVE the cards she makes using Jen Del Muro's Sketch For You To Try (SFYTT). I've always checked Jen's blog out but never participated. Here is my first card using her sketch challenge for card making day. I used a double sided piece of cardstock by Making Memories Noteworthy collection called Audrey Pink Floral. I HEART this cardstock and unfortunately I only bought 1 piece while at the craft center on base. I went back yesterday and there was NONE left. Of course because it's soooooo pretty! I love the flowers on one side and the polka dots on the other. I wanted to distress the card so I sponged all pieces with Stampin' Up! ink pad in Creamy Caramel. Hope everyone is having a great weekend! Super sweet - I love that paper!! You are a very creative woman! You can do fantastic things with paper, glue and stamps.